If you are looking for your first ever digital tablet for use at home, then you will find exactly what you are looking for with the Genius G-Pen 4500. 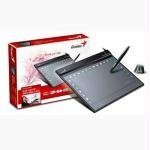 Genius are a solid make and although not as perfect and as recognised as others such as Wacom, you will find that they deliver consistently good products at very reasonable prices. You may think you need a Wacom Intuos4 for a little scribbling and digital art, but the G-Pen 4500 will be perfect to start you off. A cordless pen with 2 buttons and a 3 button wheel mouse are included as standard. Aggressively priced against the monster that is Wacom, Genius have decided to go with a comfortable 4 by 5.5 inch drawing area that will be perfect if you just want to annotate some documents or do a small amount of digital art using the supplied version of Adobe Photoshop CS or Corel Painter IX. The G-Pen graphics tablet also comes with software that allows you to easily sign your documents or emails as well as write directly to applications such as Skype or MSN Messenger. We found that the tablet installed perfectly on both our PC and also our Macbook without any issues. We recommend that you go and download the latest driver from the Genius website if you are using on a PC. The one that was supplied in the box was pretty out of date and the latest version adds a few extra bells and whistles. The software supplied with the G-Pen 4500 is pretty much what you would expect from a budget tablet. We installed Corel Painter IX to test the device and had no issues, also the PenSuite software was easy to install and allowed us to write direct into a number of applications such as Microsoft Word. The cordless pen and mouse both handle well and we had no issues with tracking on the pad. We were able to easily draw and move around the screen and found no dead spots at all. Some complain that the G-Pen 4500 powers off after a short period of time, but we had no problems at all. The pen is comfortable to hold and has the usual 2 buttons that can be used to select different pen types or thicknesses. We had ours set to the eraser and paint brush. Should I Buy The G-Pen 4500? If you are looking for a no-frills tablet that delivers a solid result, then any of the range from Genius will be perfect for you. For those of you with kids who might want to venture into making images using a tablet, this model will be a good start. You may want to opt for the slightly larger Genius Mousepen 8×6 model, which will give you a little extra space to work in. And for a slight hike in price, this may be the better option. See our Genius Mousepen 8×6 review for more information. Copyright text 2015 by Graphics Tablet Reviews.